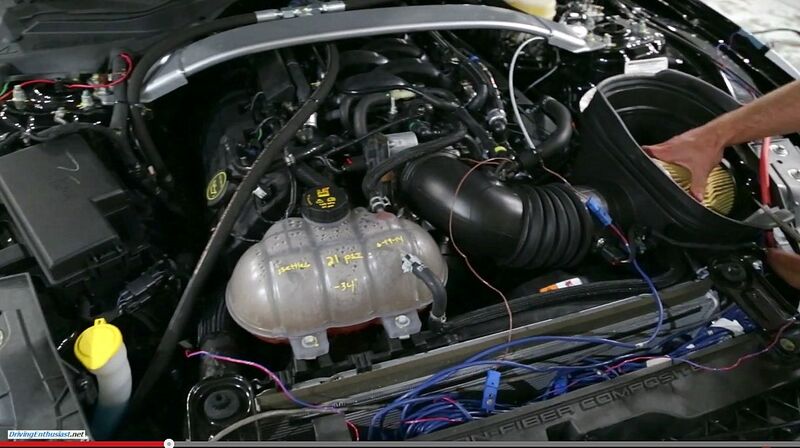 Thanks to a Ford video released today covering extreme weather testing of a prototype GT350, we also get our first look under the hood. Were you expecting a wild intake manifold, perhaps SHO-like? No, sorry. The intake manifold runners are a bit fatter – but no dual runners or anything else exotic as you might expect in this 8000 RPM engine. And look at the sheer size of that intake tube (missing a sound tube, apparently this time the engine sounds will be natural!). And the cold air filter element is considerably larger than stock. We’ll have to wait until the reveal this month at the Detroit show for more details. Hopefully we get some architectural information then, particularly details of the new crankshaft, it’s damper, and the upgrades to the cylinder heads. And while we’re hoping for direct injection, it’s not possible to answer that question from here. We’re going to be disappointed if we don’t see it when the specs are announced. Just look at the miracle work it’s done for GM’s LT1 and LT4 engines along with every other modern engine in the world. The hood brace is a standard Mustang GT part. The battery is in the stock location – it could at least have been moved to the trunk as it was in the architectural ancestor to this platform. That would help with weight distribution. What is new is the “carbon fiber composite” radiator mount. That might take a few pounds out of the extra-heavy Mustang. But we don’t see a lot of weight coming out of the GT350… there isn’t any way to get anything significant out of what is a very heavy – too heavy – car. In fact it probably pretty close to a stripped GT. And the bane of the 2015 Mustang are the options – load the GT350 with the technology packages such as power seats and navigation and you’re pushing the high 3800 range. The pounds-to-HP ratio dims further then. Remember it’s not the HP that you can brag over, it’s the weight ratio. 2 pictures follow, along with the original video.